OCTOBER 2018 • FOODSERVICE EQUIPMENT & SUPPLIES • 89 focused on food waste in the kitchen, but with other clients where you might not have trained culinarians, tracking is very important to raise awareness," Fry says. The concept of tracking is one thing but incentivizing and having a system of accountability to encourage actual, regular and consistent tracking is another. "We use key performance indicators to track compliance and hold clients accountable," Fry says. "We make food waste tracking a part of standard operating procedures, just as we encourage the use of recipes from our culinary team or require financials to be turned in." Sodexo also works with clients to donate food as a next step beyond reduction. Packaging represents another area of focus for waste reduction in the kitchen. "We worked with an athletic dining facility where we realized people were using to-go containers to eat their food in the dining hall and then throwing the containers away," Fry says. That facility now serves dine-in meals on reusable plates, and offers a to-go box InSinkErator.com/foodservice InSinkErator® disposers help keep food waste out of dumpsters and reduce waste-hauling costs, increasing kitchen efficiency and profitability. Bottom line? You save money. Want to save even more? 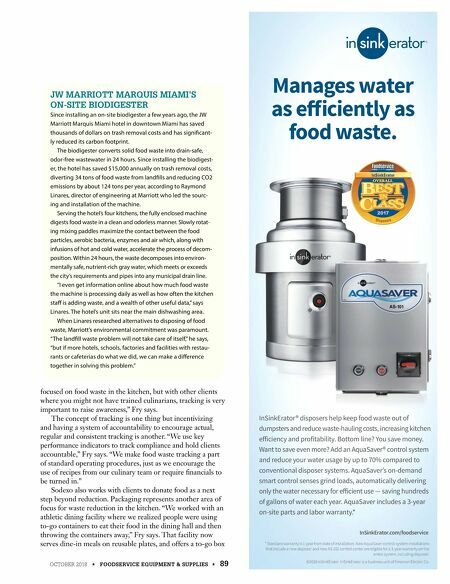 Add an AquaSaver® control system and reduce your water usage by up to 70% compared to conventional disposer systems. AquaSaver's on-demand smart control senses grind loads, automatically delivering only the water necessary for efficient use — saving hundreds of gallons of water each year. AquaSaver includes a 3-year on-site parts and labor warranty. * * Standard warranty is 1-year from date of installation. New AquaSaver control system installations that include a new disposer and new AS-101 control center are eligible for a 3-year warranty on the entire system, including disposer. ©2018 InSinkErator InSinkErator is a business unit of Emerson Electric Co. D i s p o s e r s InSinkErator Manages water as efficiently as food waste. JW MARRIOTT MARQUIS MIAMI'S ON-SITE BIODIGESTER Since installing an on-site biodigester a few years ago, the JW Marriott Marquis Miami hotel in downtown Miami has saved thousands of dollars on trash removal costs and has significant- ly reduced its carbon footprint. The biodigester converts solid food waste into drain-safe, odor-free wastewater in 24 hours. Since installing the biodigest- er, the hotel has saved $15,000 annually on trash removal costs, diverting 34 tons of food waste from landfills and reducing CO2 emissions by about 124 tons per year, according to Raymond Linares, director of engineering at Marriott who led the sourc- ing and installation of the machine. Serving the hotel's four kitchens, the fully enclosed machine digests food waste in a clean and odorless manner. Slowly rotat- ing mixing paddles maximize the contact between the food particles, aerobic bacteria, enzymes and air which, along with infusions of hot and cold water, accelerate the process of decom- position. Within 24 hours, the waste decomposes into environ- mentally safe, nutrient-rich gray water, which meets or exceeds the city's requirements and pipes into any municipal drain line. "I even get information online about how much food waste the machine is processing daily as well as how often the kitchen staff is adding waste, and a wealth of other useful data," says Linares. The hotel's unit sits near the main dishwashing area. 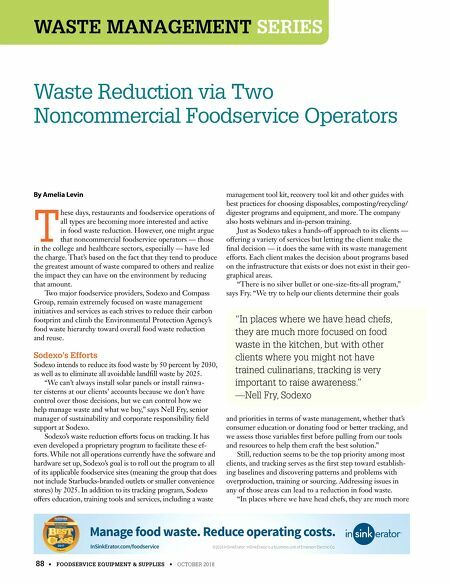 When Linares researched alternatives to disposing of food waste, Marriott's environmental commitment was paramount. "The landfill waste problem will not take care of itself," he says, "but if more hotels, schools, factories and facilities with restau- rants or cafeterias do what we did, we can make a difference together in solving this problem."